The site of the famous pub which saw Tom Paine famous bridge. Description: The Yorkshire Stingo was one of the most important pubs in old London and used to be a country hostelry! The name derives from old slang for strong beer. Innovatively an admittance charge was made, redeemable with the waiters, as a method of preventing those with no money from enjoying the facilities. In 1786, the Committee for the Relief of the Black Poor used it as one of the centres for distributing alms. During 1790 the Yorkshire Stingo was the temporary home of the second cast iron bridge ever built. This was designed by Tom Paine who had endeavoured to interest the authorities in Philadelphia and Paris in his design. A bowling green and tea gardens were added in the eighteenth century. In 1829, it became one of the first termini for the London buses. 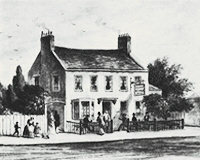 In 1836, a hall for vaudeville and burlesque, called the Apollo Saloon, was added but by 1848 the gardens were closed. The public house was finally closed in 1964. The site has since been used for the County Court and a public Baths.